Volunteers from the Schulich School of Medicine and Dentistry were given a chance to roll up their sleeves and shadow hospital staff as they worked in several units at an area hospital. Medical students from Windsor's Schulich School of Medicine and Dentistry got a close look at their potential careers while shadowing nurses on the front lines of Windsor healthcare Thursday. Volunteers from the medical school were given a chance to roll up their sleeves and shadow hospital staff as they worked in several units at an area hospital. It was a chance to "see what they do, how hard they work and how much they love their roles and profession," explained Marguerite Chevalier, chief of family practice for the school's program. Chevalier described nurses as the "heart and soul of healthcare in Canada" and said it's important for students to get used to teaming up with other medical professionals. 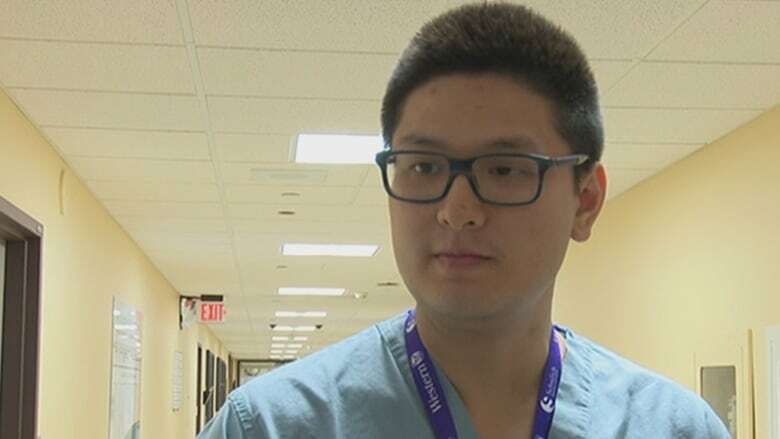 Joey Liu, a second-year student at Schulich said he has spent most of his time in the classroom so far, making any time in a hospital important and exciting — especially when it comes to working with nurses. "It's imperative that we learn how things are from their perspective because they're the first line in daily medical encounters with patients," he said. Sandra Botros, another second-year student, said she felt the same way. "I think it's really important to learn ... how they care for patients every day and how their day looks with giving drugs and caring for every day needs."